Spedester series Digital DC Drives come with an extensive range of standard software blocks, it can take control of the most demanding motion control tasks. 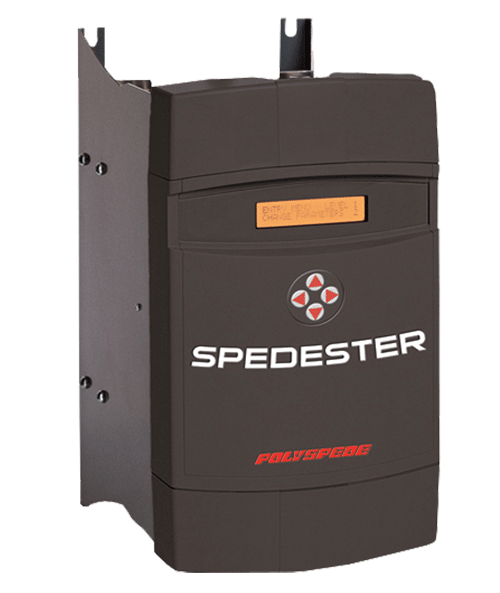 Designed for industrial applications, Spedester operates on three phase 230, 460, 575 VAC input. all outputs have short circuit protection. 17 in total, all are fully configurable. over temperature & over voltage protected. 3 user programmable drive configurations. Fault automatically saved at power off. Free drive configuration and monitoring software. Extremely flexible block diagram, including unique configuration checker, “detects shorting of user programmed block diagram output connections. Fail safe automatic ‘Revert to AVF’ on speed feedback failure. Ultra compact size offering significant panel space savings. Five feedback transducer options as standard. Non volatile trip alarm memory, even after power down. Built in ‘Oscilloscope’ output for full parameter monitoring. Three fully independent, user programmable drive configurations. Extensive, multi function programmable I/O with over 36 digital & analog input / output combinations. Full suite of center winding macros included. Built in system application blocks with description connection points. Electronic regenerative stopping facility on most Non-Regen. (2Q) models. In-depth fault monitoring and comprehensive system alarms. Serial communications to allow off site programming an remote diagnostics. Diagnostics facility available from on-board display & “in-built meter”. On-board fully controlled field with five operating modes.